The Chicago Architecture Biennial announced the first group of contributors to the 2019 edition and its publication. Titled …and other such stories, the biennial will form an expansive and multi-faceted exploration of the field of architecture and the built environment globally. The first 51 contributors — spanning the Americas, Europe, Africa, and Asia — form an initial, representative group, and include an early selection of ambitious commissioned projects. These projects will address key questions about the implications of architecture as it relates to land, memory, rights, and civic participation, and are particularly inspired by the history and conditions of the City of Chicago. ConstructLab (Berlin, Germany) and Keleketla! Library (Johannesburg, South Africa). Over the coming months, the Biennial will announce the full list of contributors and key programming for this year’s edition of the Biennial. An eponymous catalogue will also be published in conjunction with the Biennial, extending the edition’s core questions through essays by Dr. Denise Ferreira da Silva (Associate Professor and Director of The Social Justice Institute at the University of British Columbia), Eduardo O. Kohn (Associate Professor of Anthropology at McGill University), Lesley Lokko (Director and Professor, Graduate School of Architecture, University of Johannesburg) and Pelin Tan (Sociologist and Art Historian), alongside interviews and visual dossiers. This will be co-published with Columbia University Press as part of their Columbia Books on Architecture and the City series. “The participants who will explore the significant issues raised by our curators will both challenge and entertain the Biennial’s audiences: architecture professionals, Chicagoans, including those in our school program, and visitors to our city,” stated Biennial Board Chairman Jack Guthman. The Chicago Architecture Biennial is the largest architecture and design exhibition in North America. 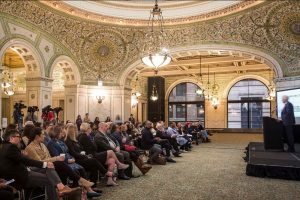 The Biennial, which is free and open to the public, will open the central exhibition in the Chicago Cultural Center on September 19, 2019 and run through January 5, 2020. Press and professional previews will take place September 17–18, 2019. The opening of the 2019 edition will again align with EXPO CHICAGO, the International Exposition of Contemporary and Modern Art. Founding sponsor BP will renew its support in 2019 as a lead sponsor alongside the Chicago Department of Cultural Affairs and Special Events, providing a strong foundation for the event’s return.